Congratulations, you’re bringing home a puppy! If your home is an RV, either full- or part-time, there are some considerations to take when dealing with the amount of energy a puppy can bring into a small space. When we brought eight-month-old Cricket home, we knew that she would fill up the space in our fifth wheel with her boundless energy. We also knew we needed to help her release that energy in productive, not destructive, ways. Although it had been a long time since I’d raised my own puppy, I was able to call upon my skills as a professional dog trainer to help us, and our RV, survive Cricket’s puppyhood in positive and fun ways. My plan included giving her appropriate outlets for chewing, exercising her mind through behavior training, and helping her get plenty of physical activity. Pick up your shoes and clothes if you don’t want puppy to destroy them. The first accommodation we made was to “puppy-proof” our fifth wheel. Puppy-proofing is just like baby-proofing your home before your child becomes mobile. Like a young child, everything a puppy can get into its mouth will be licked or chewed. You’ll want to put away anything that is dangerous for the puppy to eat, such as cleaners and cleaning supplies. If possible, hang electrical cords out of the reach of your puppy. 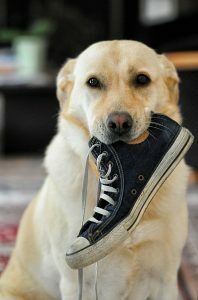 Although sometimes difficult in an RV, pick up shoes and clothing that you don’t want the puppy to destroy. We keep our shoes on a free-standing shelf by the door. For a while, you may even need to put away valuable or sentimental items you normally keep on display if they are within your puppy’s reach. For items like furniture, we used a deterrent spray that had a bitter taste to it. It kept Cricket from chewing the legs of our tables and chairs. Sadly, the fabric corners of our chairs didn’t get sprayed with the deterrent spray and Cricket noticed before we did. We weren’t as perfect with our puppy-proofing as we thought and our chairs paid the price. Live and learn! In addition to puppy-proofing our RV, we started Cricket on the path to becoming a good puppy citizen. So, when she did get her mouth on something she wasn’t supposed to (usually socks or tissues), we gave a verbal correction and taught her about the appropriate items she could chew. Our verbal correction is a simple “ah-ah” which gets Cricket’s attention. We then use that split-second after we have her attention to trade her for the items we don’t want her to have with one of her very own chew toys. Cricket’s a pretty aggressive chewer so we learned that plush toys were not going to last. Her first one lasted a week. The others we bought at the same time to replace her first one lasted two days. You read that right. Only two days. Cricket loves her rawhide chews! After that, we upgraded to tough, stuffable, rubber, chew toys and rawhide. The rubber chew toys lasted a long time, especially when we stuffed them with treats and froze them. * She still really loves the “puzzle” of trying to figure out how to get to all of the treats. 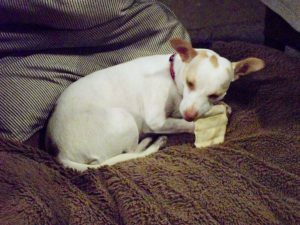 At first I didn’t want to give Cricket rawhide because of the negative reviews surrounding their use: unsupervised dogs can choke on large pieces, and any from China were not considered safe because of how they were processed. So, I found some that were made in the United States and let Cricket have one. While I watched, she happily chewed up her first rawhide chew. Cricket has learned that her stuffed, rubber chew toys and her rawhide chews are so much better than our shoes, the throw rugs in our RV, or other things we don’t want her to chew on. Now we can trade with her very easily if she gets ahold of items she’s not supposed to have. Sometimes, though, she still can’t resist those dropped tissues! Puppies all have impulse control issues and Cricket was no exception. In addition to channeling Cricket’s chewing energy, we needed to exercise her brain and train her to understand “leave-it,” “wait,” and “come.” All of these commands were to help her stay safe in and around the RV, even when her energy level was high and her impulse control was at a minimum. “Leave-it” is a fun game I like to play with Cricket. I started this training by putting a very “high-value” treat in front of her on the floor, covering it with my hand, and telling her to “leave it.” The second that she moved her snout away from it, I rewarded her with an even more valuable treat from my other hand. She quickly learned that she shouldn’t go near that item on the floor. Now, she completely looks away from the item I don’t want her to touch. This very recently kept her safe when she saw an ibuprofin pill on the floor and was going to eat it. I told her to “leave-it,” and she did. Needless to say she was rewarded handsomely for doing such a good job! Cricket knows to wait at the door. Even though going on a walk is super exciting, Cricket needed to exhibit impulse control and not bolt out the door of our fifth wheel. So, we taught her the “wait” command. When Cricket waits, it allows us to assess the situation outside before we put her down to walk. If it’s safe – no off-leash dogs near our RV and no traffic – we go. If it isn’t, we don’t go until it’s safe again. Teaching the “wait” command is fairly simple. Keep your dog leashed when practicing and have food rewards ready. Usually, though, the act of getting to go outside can be reward enough. 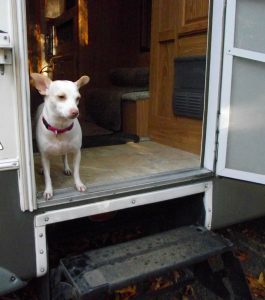 When your dog gets to the threshold of the open RV door, simply say “wait” and gently move your lower leg across the threshold in front of your dog. When your dog stops, reward your dog. Say “let’s go” and allow your dog to cross the threshold. Practice often. Cricket is now very, very good at waiting! We are still working on making sure Cricket will come to us when called. This goes against all of her instincts as a part-terrier. So, we practice during situations when we are positive she will come to us: inside our RV or outside in an empty, fenced-in play area, using a leash 20 feet long. All other times she is leashed for her safety and to follow the rules of any RV parks we stay at. So far, this training has paid off twice! Cricket got loose in an unfamiliar place and when called, she came back to us. 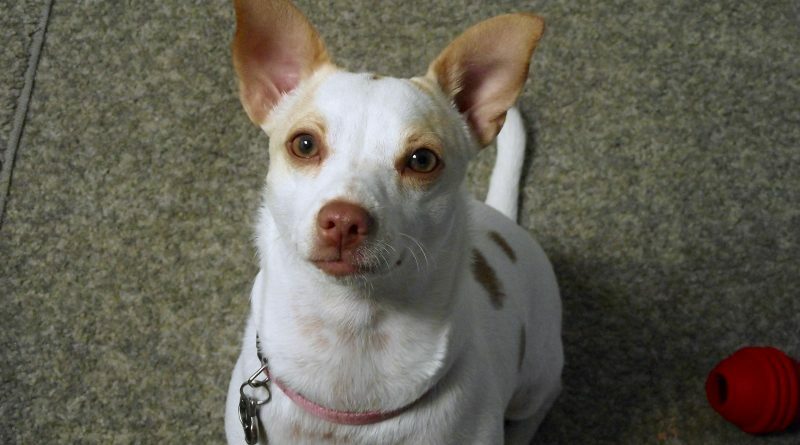 We lavished her with praise and treats because they really were “proud pet parent” moments! Physical exercise makes puppies tired. Tired puppies are better-behaved puppies. 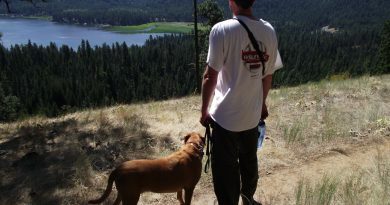 Take your puppy on walks around the RV park. Allow your puppy to sniff while on those walks. 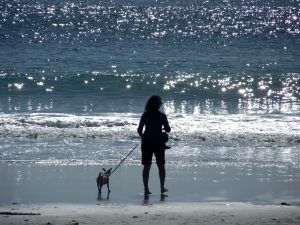 Play fetch with your puppy in the RV park’s enclosed dog area. Romp around with your puppy, even if it makes your RV bounce a little! 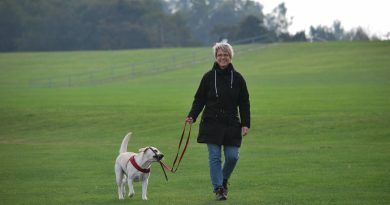 The American Kennel Club recommends three exercise sessions per day and to vary the type of exercise your puppy gets. 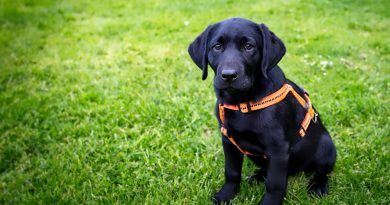 Repetitive exercise can damage your puppy’s growing body. Two short walks and a play session in your RV is a great start. Cricket getting exercise at the beach. Be sure to watch your puppy for signs that he’s tiring. You may have pushed him too far too soon and will need to take him to the vet if you see any signs of lameness. As your puppy grows he can handle longer walks and play sessions, but increase the amount of exercise time slowly. When you’re finished with an exercise session, enjoy the quiet as your puppy naps. As I type this, Cricket is snoozing in the recliner next to me. We just got back from a nice walk around the RV park. With patience and consistency, you can direct seemingly endless puppy energy into productive activities. But, if you want even more ideas, don’t hesitate to hire a certified professional dog trainer to meet your specific puppy’s need to release energy. 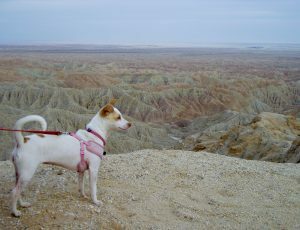 In the end, you will have bonded with a good dog and wonderful traveling companion who can’t wait to see where the road takes her next. Have you traveled in an RV with a puppy? This article was originally published on the Escapees.com blog.